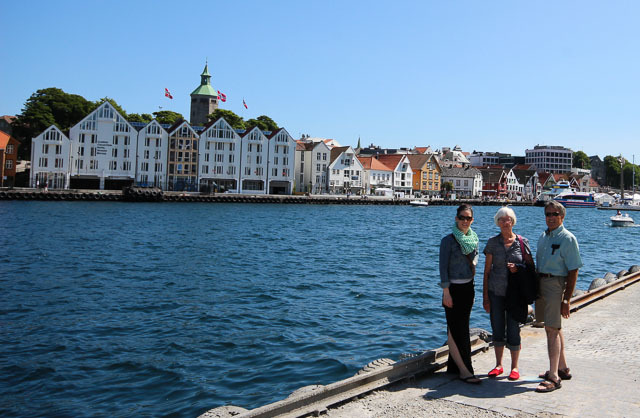 This morning, after two weeks of exploring Norway, my parents boarded their flight to return to Canada. We had such a great time and I think it's safe to say, my guests were smitten with our adopted country. It's obvious that we love having family and friends near but there's also something to be said for seeing our home through fresh eyes. We explored new parts of the region that we hadn't yet seen and we revisited favourite spots with renewed energy and a sense of pride in our home. My Mom and Dad were able to see us thriving in this location and we watched their wide eyes as they took in the beauty of Norway. It was an honour to welcome them on their first transcontinental trip and I hope this opens the door for more visits down the road! Thanks for coming Mom & Dad - you're welcome to visit anytime! So glad you got to have a great time with family!!! How fun that they had the opportunity to explore with you! I would love to visit Norway someday- it looks like such a beautiful country. Norway is such a beautiful country, I had the pleasure of visiting last December and saw the Northern Lights. You are so lucky to live there! I love being able to show my family & friends around London & Europe. It makes me feel like I'm showing them how wonderful it is to be able to live over here. I'm so glad you guys all had a great time. We waited almost 3 years for this visit and it was worth the wait. I hope you get to show your parents around Spain sometime soon! That is the best - to introduce people you love to places you love! Norway looks spectacular! Keep enjoying and exploring every inch. Thanks for sharing! Norway is pretty spectacular and a lovely place to show off! i was so nervous the first time my parents came! i thought they would take one look around and think we were crazy to have moved here! but i was pleasantly surprised that they ended up loving it and i agree, it give you a sense of pride where you now call home! so glad to hear they had a good trip! Aw, what a milestone! The perfect time to visit too, look at that blue sky! We've had pretty great weather as of late - thank goodness! I'm glad you had such a great time with your parents! :) It was fun following along on Twitter/Instagram! How lovely - I'm glad you had a great visit! I've only just moved (to Sweden) a couple of months ago and am half excited, half nervous for friends and family to visit - excited to see them and for them to see Stockholm of course, but kind of nervous about the whole 'worlds colliding' thing too!